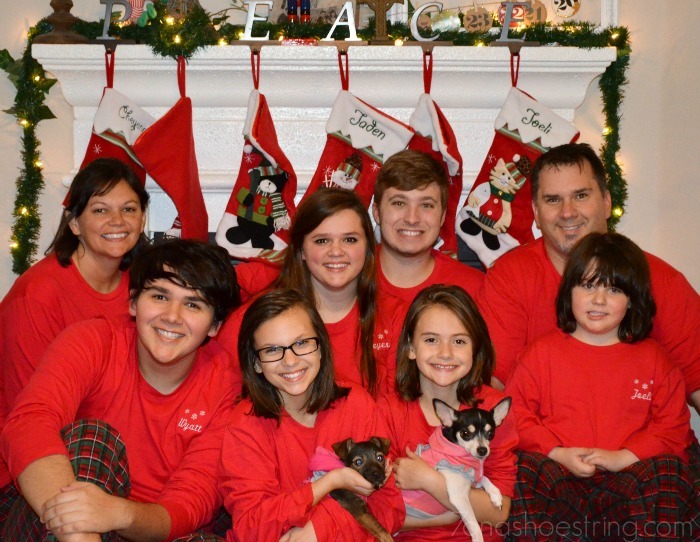 If you can get 8 people, including 3 teenagers, to all wear the same personalized pajamas for a party, you must be amazing! That is how I am feeling about Personal Creations after this past Monday. It was a first of a new tradition in our family. My family is used to me coming at them with new and different ideas. Late last week I was excited about a big box that arrived and couldn’t wait to show the kids. Their joy was not quite matching mine that day… but things changed on Monday evening. With our teens work and school schedule, Monday night was one of the few available opportunities for our pajama party. I passed out pajamas and every one changed into them and the fun was spontaneous after that. How did we do it? Well, it began with picking out the pajamas. I did this all one my own to surprise everyone. I ordered the Warm and Cozy Pajamas for all 8 of us complete with our names on each one. We get the kids pajamas every year for Christmas, this year they all just happened to match and they got them early. Next, it was a myriad of family fun and traditions to round out the night. Tree Trimming: Last year we put our first personalized ornaments on the tree thanks to Personal Creations. This year, in our matching pajamas, we each hung our own ornament on the tree to finish the tree trimming tradition. Movie Watching: There are a few movies we watch every holiday season. We went back and forth on the one we wanted to watch in particular for our pajama party and voted on Elf. 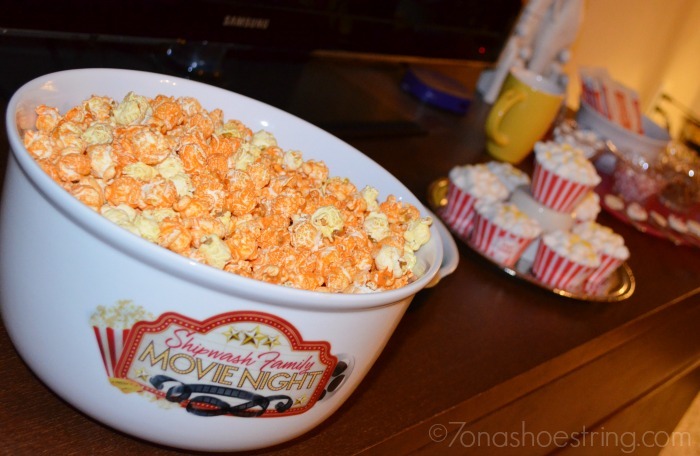 The Family Movie Night Popcorn Bowl was perfect for holding all of the popcorn. Plus, the kids could not get enough of the “sour kiddos” that came inside. Hot Chocolate Tray: We love our hot drinks during the cold months. 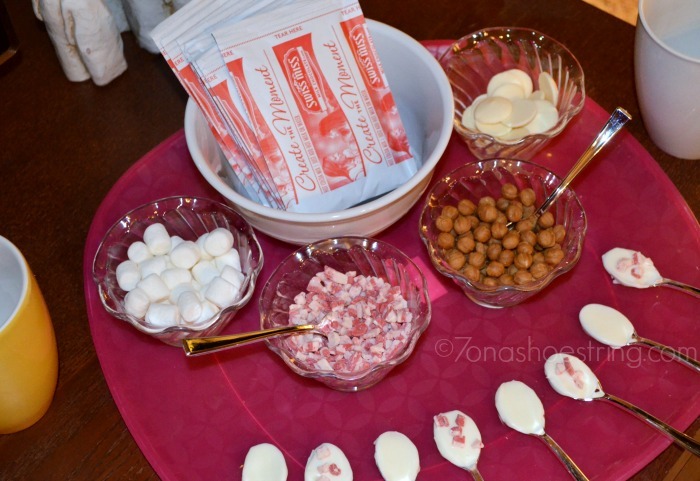 We set up a tray filled with hot chocolate, peppermint pieces, marshmallows, and even white chocolate covered spoons to enjoy through the evening. 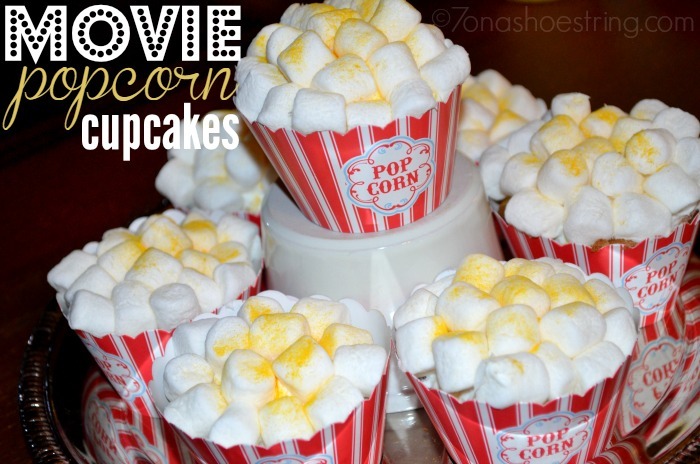 Oh, and I can’t forget the delicious Movie Popcorn Cupcakes! I had them a few years ago and fell in love with the mixture of cupcake, frosting and marshmallows. The marshmallows are amazing. So, our movie watching pajama party was a great excuse reason to make them! Top cupcake with marshmallows to create “popcorn” look. Brush yellow powder food color on top of marshmallows for buttery effect (completely optional, of course). They are so good! I may have eaten more than my fair share of “popcorn” this way. But, hey, it was worth it for the fun and laughs we had that evening. A few games of Charades, Gossip, and Name that Tune finished off our time together. 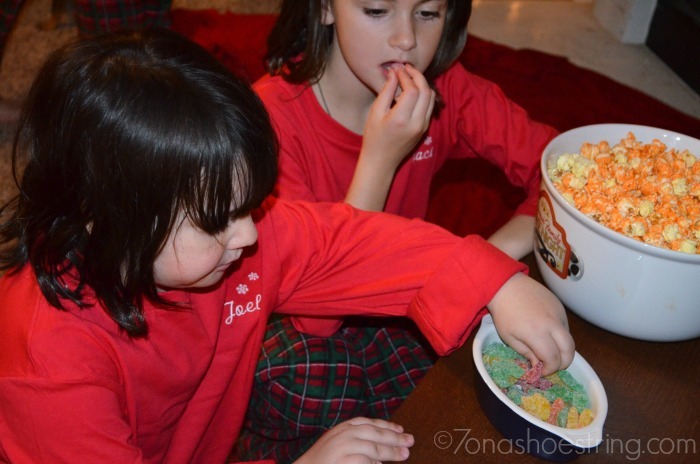 Amazing how a few pairs of personalized pajamas could spark such an incredible night of family traditions. 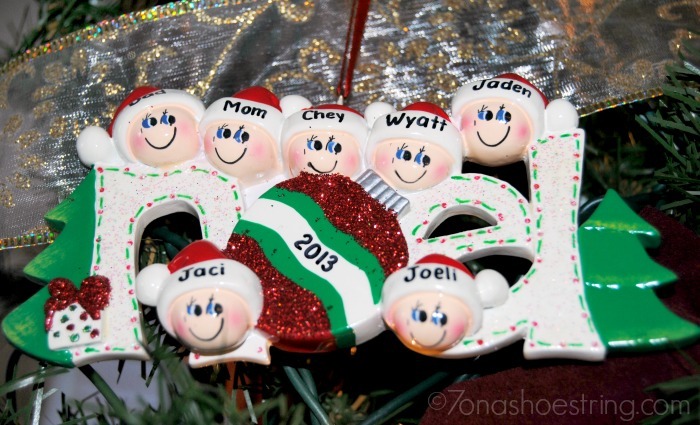 What holiday traditions does your family partake in each year? Learn more about the many wonderful personalized ornaments, apparel and household items listed above by liking Personal Creations on Facebook and following @PCGifts on Twitter.